On 13 December 2016, UNU-IAS jointly organized the G7 public symposium Resource Efficiency and a Low-Carbon Society: Identifying Opportunities and Implications, in collaboration with the Ministry of the Environment of Japan and the Institute for Global Environmental Strategies (IGES). The event brought together representatives from G7 Member States and other stakeholders, including from the public and private sectors, academia and international organizations, to enhance understanding of the relationship between resource efficiency and climate change, and share best practices in technology, business, and policy that both improve resource efficiency and reduce greenhouse gas emissions. 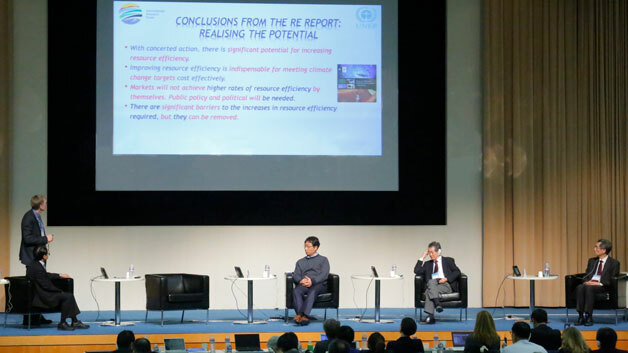 Following opening remarks by the State Minister of the Environment, Japan and the Chair of the Board of Directors, IGES, Junko Nishikawa (UNU-IAS) summarised discussions that had taken place in a G7 Alliance workshop held back-to-back with the symposium. She noted that participants in the workshop had shared recognition of the importance of promoting better linkages between resource efficiency and low carbonization, pursuing synergy and overcoming challenges in the nexus of resource efficiency and low carbonization, and defining a resource-efficient society, while achieving the goals of the Paris Agreement. The first panel discussion focused on the need to integrate resource efficiency, climate policies, and current progress into international discussion. Janez Potocnik (Co-chair of the International Resource Panel) highlighted the need for a new economic model based on sustainable consumption and production as a central ingredient for delivering the Sustainable Development Goals (SDGs). Yuichi Moriguchi (Professor, University of Tokyo) emphasized the importance of strengthening coordinated approaches beyond silos both in government offices and academic disciplines. Kohmei Halada (Senior Special Missions Scientist, National Institute for Materials Science, Japan) urged a shift in focus to actions rather than knowledge building, given the urgency of the challenges that we face. The panel discussions that followed dealt with ongoing efforts in G7 Member States and best practices of businesses and municipalities. Current plans to update the agenda in advance of the next G7 Summit to be held in Italy were also introduced. Active discussions among panellists included potential areas of support by governments to promote business practices and local initiatives. Interactive discussion with the audience focused on policy measures adopted by G7 Member States other than Japan. The programme of the symposium, as well as the co-chairs’ summary of the G7 Alliance workshop, can be downloaded under the Related Files tab.